Even as Canadians continue to protest the arrival last week in Vancouver of a ship carrying about 500 Sri Lankan Tamil asylum seekers, Canada's first Sikh MP Gurbax Singh Malhi has been dragged into the divisive issue for his alleged support for the Tamil Tigers. The six-times MP is angry after a columnist in the Toronto Sun named him for his alleged support for the Tamil Tigers. "Why are we pretending these Tamils are refugees, when even the bleeding hearts at the UN don't? Let's ask Gurbax Singh Malhi, a Liberal MP who spoke at a Tamil Tiger rally on Parliament Hill (Canada's parliament) last March, surrounded by the terrorist group's flags and portraits of Prabhakaran,'' columnist Ezra Levant wrote, indicting the longest serving Indo-Canadian MP. "You are here today for a great cause. I am helping you guys, I am behind you because you're fighting for the right cause,'' the columnist quoted the Sikh MP as telling Tamil protesters who were demanding Canadian intervention to stop Sri Lankan assault on the LTTE just before it was destroyed in May 2009. Malhi, who in 1993 became the first turbaned Sikh to be elected as an MP in the western world, has represented the Indian-dominant constituency of Bramalea-Gore-Malton on the outskirts of Toronto since then. The arrival of the Thai ship "MV Sun Sea" with 490 Tamil asylum seekers has angered Canadians, with calls for sending them back. Each person reportedly paid $40,000-$50,000 to make the voyage to Canada, according to the local media. 1. Black List: The community feels aggrieved of a so called black list, the shadow of which lingers upon every settler here when he thinks of visiting India. He is haunted by the treatment likely to be meted out to him at the Airports in India, of being harassed or even asked to go back. 1. I suggest that the names in the black list be made public. 2. I suggest that those who are wanted in India in any activity amounting to an offence may be subjected to the extradition proceedings, pursuant to the year 1987 extradition treaty signed between India and Canada. Further, the names of people not involved in any criminal activity be removed from the blacklist, so that innocent people can visit their home country without any fear. 2. Air India 1985 Tragedy: The Air India 182 tragedy of 1985 still haunts every Sikh in Canada as a suspect and party to it. We want this matter to be clarified in an effective way. We feel India had the same powers and the jurisdiction under the International Law to commence proceedings in India and bring perpetrators to justice, by way of an independent inquiry, investigation or trial, towards which direction India has not taken a single step. Commission after commission in Canada has only scratched the old wounds of the victims’ families and cast cloud on entire Sikh community which we want to be cleared as early as possible. A step in this direction will help the entire community re-gain its self pride and redress feelings of the injured. 3. Justice for 1984 Riots’ Victims: There is wide spread anguish that victims of 1984 riots at New Delhi and other places have not received justice. Commissions have been set up in India with respect to this issue, but 26 years is already too long a wait for the victims and their families. The perpetrators have not been punished; the victims have not been taken care of in a way that human considerations required. We urge the Government of India to fast-track the delivery of justice with concrete results, to take the necessary steps to bring the perpetrators to justice and compensate the families of the victims. At least, the sons and daughters of those who were killed should be provided opportunity in terms of service and financial help in the marriage of their daughters. 4. Historical Articles of Golden Temple: The articles of historical value, which bring a sense of pride to the Sikhs, seized from the Golden Temple need to be returned. Please take measures so that this chapter is closed respecting the feelings of the Sikh community. 6. Fraud Marriages: There are complaints of fraud marriages, but there are no effective means to deal with them. People involved in such fraudulent activities should be charged criminally, wherever found, and extradited from Canada, if required. To give justice to the families of innocent victims, we request the Government of India to check the increasing tendency of marriage related frauds, and make effective provisions punishing the offenders. 7. Old Age Security (Pensions): Forty Nine (49) countries have signed bilateral treaties with Canada, whereby elderly people migrating from those countries get preferential treatment in getting old age security (pension). This treatment is not given to the elderly people coming to Canada from countries who have not signed the bilateral treaty with Canada. India is one of those countries who have not signed any such bilateral treaty. We request that immediate steps be taken so that the elderly people coming from India could get old age security, as those emigrating from the 49 countries with which Canada already has bilateral treaties. 8. Proclaimed Offenders: There is large number of persons who are declared in India as proclaimed offenders in false fabricated and concocted cases. Although this matter relates to States, yet Government of India, we feel, can take steps to have those cases re-investigated to find truth and absolve those who are innocent. Point of interest: Hon. Gurbax Malhi has spoken fifty five (55) times in the Canadian House of Commons on matters of concern for the South Asian community. Credentials: Hon. 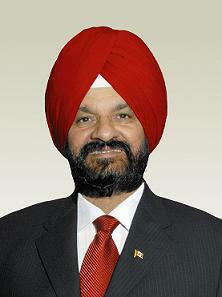 Gurbax Singh Malhi was first elected to the Canadian House of Commons in 1993 and was subsequently re-elected in 1997, 2000, 2004, 2006, and 2008. While serving in the House of Commons, Mr. Malhi has acted as Chairman of the House of Commons Standing Joint Committee for the Library of Parliament, as well as Parliamentary Secretary to the Minister of National Revenue, the Minister of Human Resources and Skills Development, the Minister of Industry with Special Emphasis on Entrepreneurs and New Canadians, and the Minister of Labour. Gurbax Malhi, Canada's longest-serving Indo-Canadian member of parliament and the first turbaned Sikh MP in the West, has denied signing the motion on the 1984 anti-Sikh riots which was tabled last week in the Canadian parliament. Malhi, who was reported by the media to have signed the motion, Tuesday denied this. In a statement here, Malhi said, "Recent media reports have alleged that I supported the petition. I did not sign the petition. I was not present at the June 9 memorial/rally event on Parliament Hill (the seat of parliament) when the petition was read out in public and I was not in attendance on June 10 when the petition was read in the House of Commons. "The statement read by me in the House of Commons on June 9, 2010, demanding justice for the families of victims in the 1984 anti-Sikh riots and the 1985 Air India bombing is independent, not related to the petition." In his own statement in parliament June 9, Malhi had said, "In November 1984, an anti-Sikh pogrom of violence, rapes and killings took place in New Delhi and many other Indian cities, resulting in the deaths of thousands more. In June 1985, Air India flight 182 was blown up mid-air and over 300 people died. "I strongly urge the Indian and Canadian governments to take all reasonable measures to ensure that justice prevails for innocent victims' families. Both countries should work together to ensure that such tragedies never happen again." Malhi, who created history in 1993 by becoming the first turbaned Sikh MP anywhere in the western world, has been elected six times uninterrupted since then. He represents the Punjabi-dominant constituency of Bramalea-Gore-Malton on the outskirts of Toronto. The residents of Bramalea-Gore-Malton voted the Liberal incumbent back for a fifth consecutive term, by a wide margin. Malhi supporters, who fell silent when CTV declared a Conservative minority government at 10 p.m., roared their approval when the veteran MP arrived at the Woodbine Banquet & Convention Centre. Dressed casually, Malhi looked overwhelmed as he was embraced by supporters after he arrived at around 11 p.m.
"I stayed on my proven record, I listened to people and spoke with them and the people elected me again," Malhi said. "I want to keep on representing the people, as I have done since 1993." The riding was supposed to be hotly contested, with some pundits predicting a Conservative win. However, the residents went with the candidate they knew, giving Malhi their unwavering support with 25,349 votes or 50.7 per cent of the total votes cast in the riding. Conservative candidate John Sprovieri took 16,310 votes, or 32.6 per cent, while the NDP's Cesar Martello received 6,400 votes, or 12.8 per cent. Green Party candidate Ernst Braendli won 1,721 votes while Marxist-Leninist Frank Chilelli captured 233 votes. Sprovieri, whose campaign featured a series of gaffs, said the 905 populace wasn't ready for the Conservative party's philosophy. "We weren't able to get our message across to everyone," said Sprovieri, at a reception inside Speranza Banquet Hall. "I'm disappointed no (Tories) from Peel (Region) made it. I thought at least one of us would be voted in but obviously the people are happy with what they got from the Liberals. If the majority of people stick with what they know, then what's the use? It's like banging your head against a brick wall." During the campaign, there was a posting on Sprovieri's campaign website declaring "I am a woman." He placed an erroneous advertisement in several ethnic newspapers saying he would reduce seniors' pensions, he made damning remarks about fellow Conservative candidate Raminder Gill (who lost in the Mississauga-Streetsville riding) and mocked Malhi for his English language skills. Malhi campaign worker Jeewen Gill said the incumbent worked hard throughout the election and that made the difference with voters, helping to overcome his party's perceived trust issues. Gill said Malhi's campaign instead focused on his long list of achievements. "We told voters what he had done for the last 13 years," said Gill. "We expected a win when the polls started. We expected a victory for us." Meanwhile, Sprovieri supporter Marc Comtois said the Conservative was a "tremendous" person and his absence from the House Of Commons will be a "loss for the country. "I'm not trying to be critical of Mr. Malhi, but John deserved to be in," said Comtois. In the previous election, Malhi won by an overwhelming majority, capturing 20,394 votes compared to the Conservative's 12,594 and the NDP's 6,089.